Teachers should embed this video in a presentation to create conversation about the history of atmospheric science and climate change. Today we have data regarding the amount of CO2 in the atmosphere, changes in air temperature, sea level rise, and ice cap melting that confirms the comments made by the scientist in the 1958 video. This video, produced during the International Geophysical Year in 1958, focuses on how increasing atmospheric CO2 through industrial processes will absorb more heat, raise atmospheric temperatures, and likely cause melting of the polar ice caps, resulting in sea level rise. 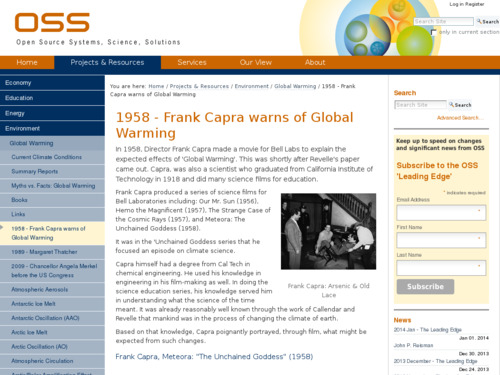 Comments from expert scientist: The short movie clip gives a feel of the important phenomena of Global Warming and climate change being perceived in 1958. The video demonstrates that the scientific community has understood for decades that increases in gases that trap heat can impact global temperatures and lead to "catastrophic changes in our environment." This video explains that CO2 from automobiles and factories could cause global temperatures to rise, melting ice caps and causing a rise in sea level. The video is of very good quality with a classic look and sound.